Overlooking Makrigialos Bay and within a 5-10 minute walk from all amenities, Grapevines is a stunning new complex of 20 European-styled townhouses. 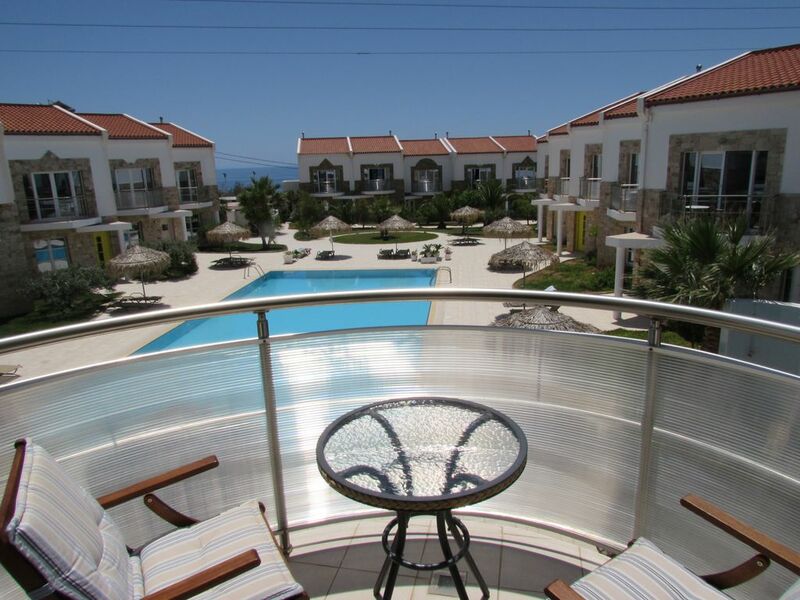 The property comprises 2 bedrooms (1 en-suite), bathroom and shower room, roof terrace and balconies to front and rear with stunning sea and mountain views, private gardens and secure car parking. It is fully fitted with all modern amenities and finished to a very high standard. The front balcony overlooks the 20 metre floodlit swimming pool set within immaculate landscaped gardens. Towels are provided and can be changed mid week for a small charge. Request this with Rosemary our site manager. We offer onsite private parking. Both towels for use in the villa and beach towels are provided. TV with DVD player, leather corner suite which converts to sofa bed, coffee table, dining table and chairs. Fully fitted modern kitchen with: hob/stove, oven, fridge/freezer, microwave, health grill, TV, air-conditioning, dishwasher, wood burning stove. Front balcony with a sea view, overlooking the complex. Rear balcony with a view of the mountains. When front balcony is in the sun the rear balcony is in the shade. Secluded roof top terrace with stunning mountain views. Beautifully clean, 20m pool with a shallow end. Notes on accommodation: Air-conditioning in all main areas. Spiral staircase has secure safety gates at all levels. Cot and high chair available on request. Ideal location for a relaxing romantic break or family holiday. Outside: Landscaped gardens, shared 20m x 10m swimming pool, sun loungers, private car parking space within a gated complex. Utility Room: Washing machine, iron and ironing board. Cleaning / Towels / Linen / Maid service: Bedlinen and towels all available. Other: Garden and roof terrace with sun loungers. Balconies with table to front and rear of living area. When one balcony is in the sun the other is in the shade. The villa is situated at the top of the complex and has the added advantage of no traffic noise. We had a lovely fortnight staying at number 18. It was very clean, well equipped and felt spacious with 4 adults. The front balcony was great for morning coffee and to watch the sunset in the evening. The rear larger balcony was peftect for lunch, providing shade and lovely views of the mountains - we were lucky enough to see 3 eagles soaring above one day. We didn't use the rooftop solarium but that also had great views. The complex is well maintained and feels very calm and secluded. The large pool is lovely if a bit on the chilly side when you first get in! The local beaches are just a 10 minute stroll away, with lovely soft sand and are spotlessly clean. The sea is clear and warm, and shallow enough to be ideal for children. The bars and restaurants we visited were all really good for food and service, and we found enough choice for us veggies. We would definitely recommend this property and resort,. 5 minute walk to beautiful blue flag beach suitable for children. Also lots of watersports available to suit the more adventurous! Car hire is recommended. Heraklion airport is 90 mins drive. Makrigalos is a 5 - 10 minute walk away. The nearest large town of Ierapetra is a 30 minute drive along a pleasant coastal road. Makrigialos is a friendly fishing village with a beautiful long beach. There are also many secluded coves nearby. The beaches are never overcrowded and suitable for swimmers of all ages and abilities. The most picturesque area of the town is the harbour which is packed with restaurants and tavernas to suit all tastes. Souvenir shops selling pottery, leather goods and jewellery are all available as well as 2 excellent bakeries, a butcher's (stocking British produce) and several supermarkets are all within close proximity of each other. Water sport facilities, tennis, mini golf, a bank, pharmacy, doctor, dentist, florist and car rental are also easily accessible in the village. Booking Notes: Please call for further information, to discuss requirements and arrange booking. Changeover Day: Flexible. Notes on prices: Prices are for the property per week paid in UK pounds. Discount available on 2nd week of rental. Special rates available for long term winter rentals.